They’re described as cigars with wings, but clustered in the thousands at a great height, they resemble something else entirely, a cloud of mosquitos or debris from a churning tornado. 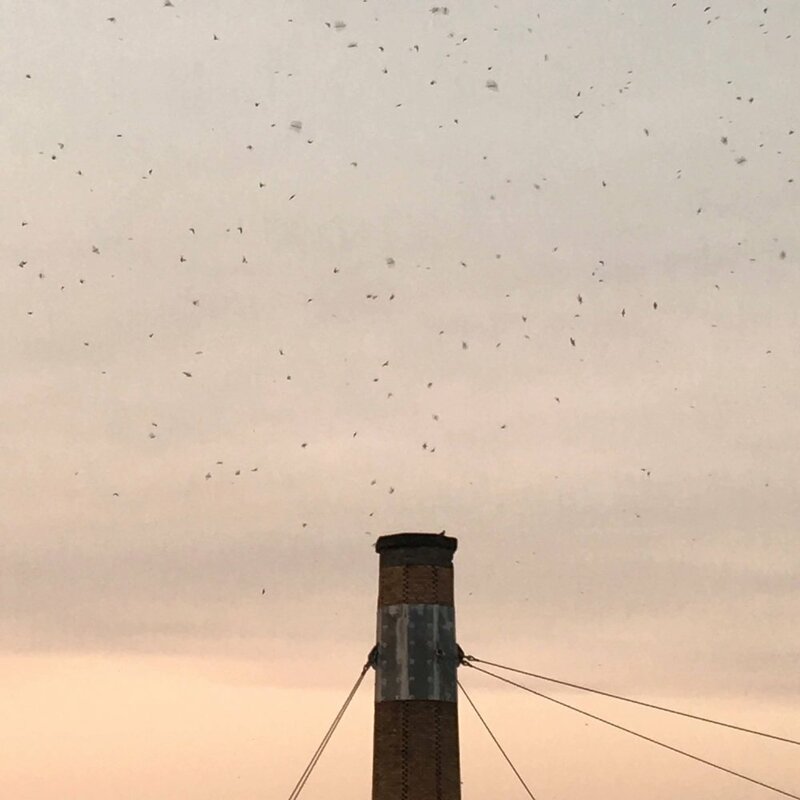 Every year Vaux’s Swifts pass through Portland on their southern migration route, and their chosen evening roost is the chimney of Chapman Elementary School. When they turn in for the night it’s quite a show. Any September evening, arrive in the NW neighborhood by 6 to snag street parking (though there are also available spots at the Montgomery Park building). Then roll out your blanket on the hill overlooking the school. It gets quite crowded with people of all ages and backgrounds. There’s something very pure about the scene. No one’s too cool to watch some birds. While you wait for the action to start, the Audubon Society has a table with info posters to read and reps on hand to answer questions. You may also witness kids practicing soccer on the field below. It is, after all, an elementary school, and it’s business as usual. The early birds arrive. You can barely see the hawk sitting on the top of the chimney. The flock arrives gradually over the course of two hours. They cluster and weave across the roof, sweeping over the tall brick chimney but not entering. More swifts appear, and the cloud grows denser and picks up speed then intermittently disperses. If there’s a pattern to their circuit, we haven’t figured it out, but it’s fun to keep trying. At its peak, the mass contains up to six thousand birds. It roils in the sky in a way that’s almost supernatural, suggesting a portal opening up to another world. It’s all surprisingly quiet. Any chirping is soft and drowned out by human voices. Sunset provides a brilliant backdrop, pinks and oranges and the dark silhouette of the West Hills. Added bonus of a great sunset. 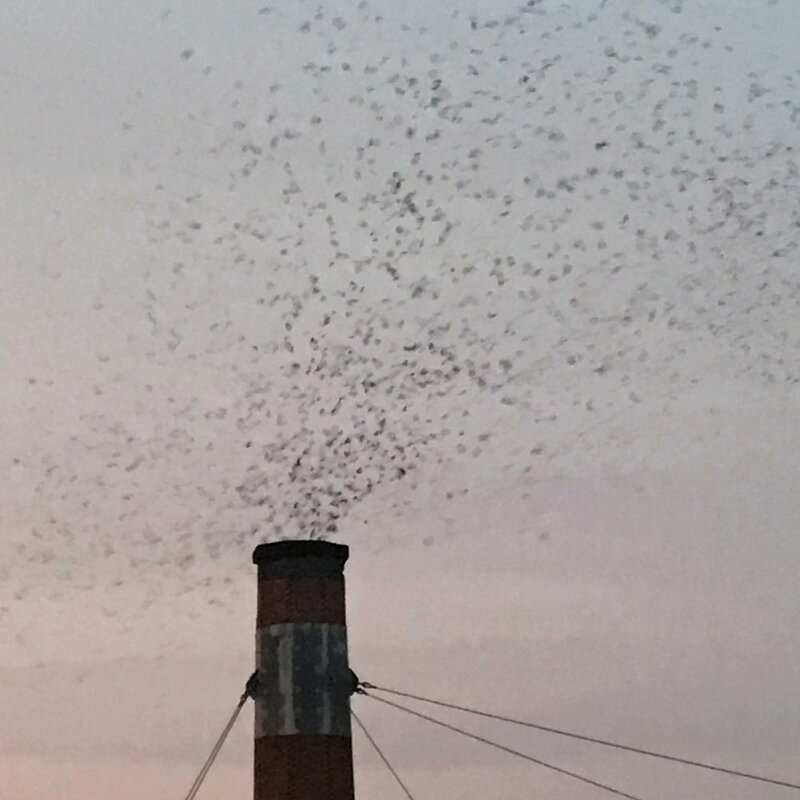 And suddenly, as if someone’s pulled a bathtub drain, the swarm of birds funnels into the chimney. It’s all very dramatic. Occasionally an opportunist hawk might swoop in and grab a snack, but overall it’s a triumphant affair for the flock, and the crowd always cheers. And suddenly the Swifts begin dropping into the chimney. In the morning, these swifts will move on and the next evening an entirely new group of birds will perform the ritual.